This is a 4 Man Scramble Golf Tournament. Anyone can have a team. 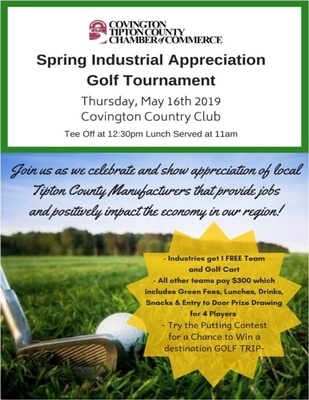 Tipton County Manufacturers receive one FREE Team and golf cart rental! Participate in the Putting Contest for a chance to win a destination golf trip! Sponsorship Opportunities range from $100-$1000. Donations are accepted for door prizes. Tipton County Manufacturers recieve 1 FREE Team and golf cart. All others are welcome to have a Team for $300 and rent golf carts for $40/each. Sponsorship opportunties are available and donations are accepted for door prizes!